3rd annual celebration benefits the San Diego Humane Society. 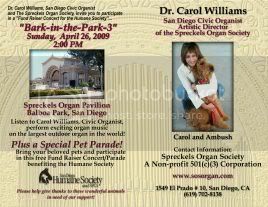 Pet friendly music performed on the majestic Spreckels Organ by San Diego Civic Organist Carol Williams followed by a special Pet Parade! For a FREE In-Home dog training demonstration, call 619-818-6462.